As if the Faculty Lounge Fascists who run Cal-Berkeley haven’t already proven what bloodthirsty garbage they are, NOW the administration and faculty are trying to pretend that it’s wrong for the rest of the country to have NOTICED their masked, black-clad thugs beating bloody anyone who expresses an opinion they disagree with. Cal-Berkeley is to the Left-Wing Archie Bunkers of the 1960s generation what Nuremberg was to the Nazis. First the Nazis took pride in the Nuremberg Rallies and saw them as the mark of their ascent, but then the later war-crimes trials at Nuremberg gave the place a whole different meaning. The Left-Wing Archie Bunkers of the 1960s who now run American colleges and universities used to take pride in Cal-Berkeley’s significance to the Free Speech Movement. Now, however, Cal-Berkeley has come to epitomize the hypocrisy of the American Left and the Faculty Lounge Fascists who abuse their positions to browbeat students into agreeing with their outdated 1960s worldview. The forever-hypocritical 1960s generation of American Liberals were all about Free Speech when THEIR ideas were the ones offending people. Once they considered themselves to be comfortably in the cultural, educational and political driver’s seat by the early 1990s they decided they wanted their own already outdated worldview enshrined in stone and presented as THE one true set of values. For this first installment we’ll compare and contrast the way a reasonable person and a Left-Wing Archie Bunker would react to being told a fanatic has just slain over a dozen innocent people in cold blood. Reasonable Person’s Reaction: What a horrible thing to do! I hope they catch the person who did it! Left-Wing Archie Bunker’s Reaction: What religion was the shooter? If they were a Muslim their religion had nothing to do with it, but if they were a Christian then it proves that Christians are dangerous to us all. You see, while the Reasonable Person is able to express their reaction right away the Left-Wing Archie Bunker has to make sure the killer wasn’t a Muslim. If the shooter WAS a Muslim then that changes the way the Left-Wing Archie Bunker feels permitted to react. As I’ve mentioned before, American Liberals have reduced themselves to barely human political robots. Rather than have spontaneous human reactions they are programmed to filter everything through the prism of their many, MANY political prejudices. Left-Wing Archie Bunker: Damn American foreign policy for making this otherwise peace-loving Muslim gentleman murder my children act out in legitimate resistance to American imperialism and/or Islamophobia! Yes, Left-Wing Archie Bunkers – especially the ones from the prolonged adolescence of the “academic world” (LMFAO) – are relics of a time when the Western World was long past due for some collective introspection and reevaluation. Once again Camille Paglia shines in an examination of various subjects near and dear to my heart – censorship by the Political Correctness Police, the way the American Left crawls for Islam and how pretentious Liberal asses have destroyed the concept of intellectual inquiry and the free exchange of ideas in the academic world. She nicely chronicles the decline of American colleges and universities into their present state as the Democratic Party’s secular churches. An extra bit of fun is the way many of her remarks reinforce the remarks I made recently about the way that the worst of the faux “intellectuals” of the self-centered 1960s Liberals avoided failure in the real world by hiding in the prolonged adolescence of the academic world. Unfortunately they felt their job as “teachers” was to abuse their authority over their students by browbeating them into agreeing with their outdated (by FIVE DECADES now) political opinions. *** *** *** *** *** *** *** *** *** *** It’s always 1967 to a large segment of the American Left. Left-Wing Archie Bunker: Back in MYYYY day, you were on the right side of an issue as long as you automatically sided with the enemies of the Western World! The Left-Wing Archie Bunkers of the 1960s generation like to pretend every war is the Vietnam War all over again. Even against the intolerant forces of Muslim fascism the gutless hypocrites of “the most self-aggrandizing generation” continue to twist logic as severely as they have to in order to take sides against the Western World. They also push the concept of allegedly “unwinnable wars.” The expression “unwinnable wars” needs put in perspective. In modern warfare a victorious nation shows restraint and does not bombard an entire nation into submission like was done to Germany in World War Two for instance. That restraint means that when the conventional war is won there is a sufficiently effective enemy network still at large in the defeated nations. The existence of such networks – often aided by forces outside the defeated country – means that any victorious nation needs to be prepared to maintain forces in the defeated nation for literally two decades AT LEAST. That will not happen because the civilized world’s enemies (Muslim fanatics at present) know that as long as they can maintain ANY level of hostile activity they can count on the spineless and self-aggrandizing political left in the Western Democracies to do politically what they themselves cannot do militarily – force a premature withdrawal of the victorious forces. American Liberals are the biggest offenders on that score – especially the nauseatingly self-congratulatory 1960s generation of American Liberals who STILL use every conflict as an excuse to pathetically try to relive their youthful protests of the Vietnam War. Those pompous fools always ignore the fact that America and the other Western Democracies are now facing AN ENTIRELY DIFFERENT TYPE OF FOE and AN ENTIRELY DIFFERENT SITUATION. 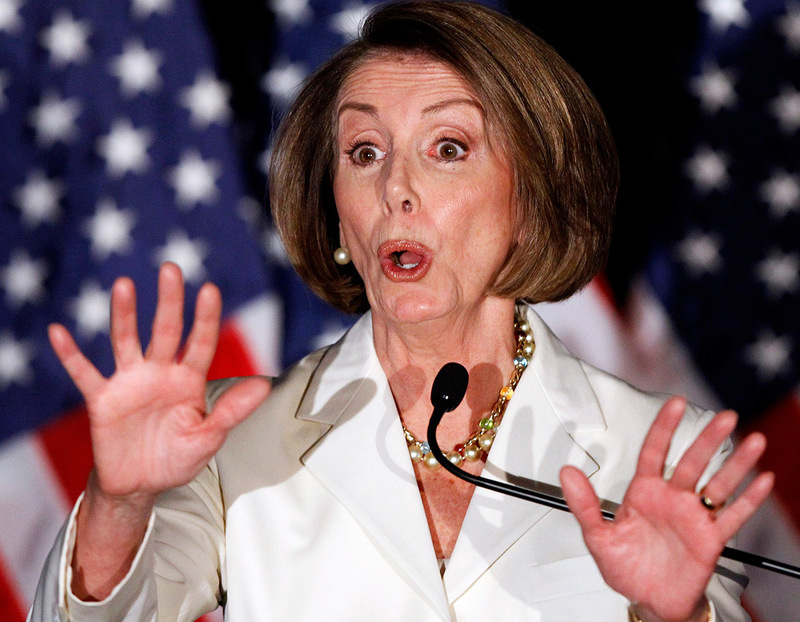 Nancy Pelosi, the poster child for having way too much plastic surgery, thinks the U.S. should withdraw from San Diego and Minneapolis. Six male Muslims were arrested in San Diego and Minneapolis in anti-terrorist raids on Sunday. The men were seized for attempting to aid the Islamic Republic, which was spawned by Barack Obama’s premature withdrawal from Iraq.